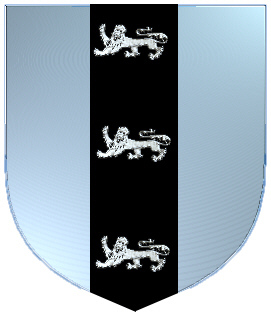 Coat of Arms: A silver shield with vertical black stripe on which there are three silver lions. 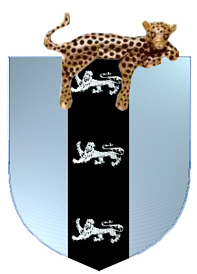 Crest: A leopard and a shield with the Coat of Arms. 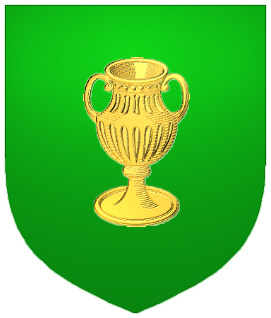 A golden cup at the center of a green shield. From the French word "tailler" which means "to cut", a tailor was originally a cutter of cloth. As such, the name came into use early in Scotland's history - Alexander le Taillur was a valet to King Alexander III in the last quarter of the 13th century. There were six landowners with the name Taylor who were of sufficient stature to be required to sign the "Ragman Roll" of King Edward in August 1296. Their lands ranged in places across Southern and Central Scotland such as Roxburghshire in the Borders, Edinburgh and Lanark, to as far north as the county of Angus. In the early days, the name was often rendered in the Latin form "cissor" (from which the English word scissor is derived) and around 1137, Walter Cissor was granted land by King David II and William Cissor held a tenement in Edinburgh in 1392. Scissor and Cissor were recorded in Inverness and Perth in the 15th century. But, unlike the name Taylor which became prolific, the Cissor variant died out - possibly with some of the holders changing to Taylor. The taylor family can trace their ancestors back to the ancient territories of Scotland between the 11th and 12th centuries. TAYLOR (British). "Tailor" (Old French). The name spread into the Gaelic-speaking Highlands and became Macantaillear and Macintaylor but did not become widespread. However, "Taillear dubh na tuaighe" (Black Taylor of the battle-axe) was a legendary follower of Cameron of Lochiel. A number of Macintaileours were fined for providing shelter to members of the outlawed clan Macgregor in 1613. James Taylor was involved with William Symington in building the first practical steam-powered ship in 1788. It sailed on Dalswinton Loch and a second vessel, powered by a larger engine, plied the Forth and Clyde canal. In the first half of the 19th century, Dr John Taylor championed causes of political liberty including the movement for Greek independence from Turkey. At a time when trade unions were frowned on, he became the editor of "Liberator" which advocated the extension of voting rights, by revolution or republicanism if necessary. He was regarded as an extremist in his day, fighting for measures which we take for granted now. 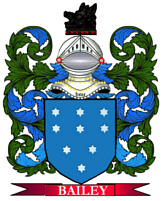 The Taylor clan motto is "In cruce salus" which means "Salvation from the Cross".